From the green jacket bestowed on the winner to tournament officials’ insistance on referring to spectators as “patrons,” The Masters golf tournament is one of the most tradition-bound sporting events in the U.S. But that hasn’t stopped the tournament’s organizers from embracing the iOS platform. And this year is no exception. 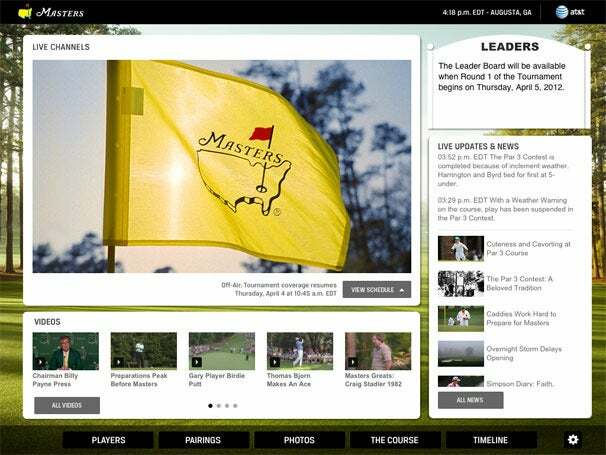 When The Masters tees off Thursday, iPad and iPhone apps will provide live streaming video of some of the action. Augusta National has rolled out iPhone and iPad offerings for watching this year’s Masters from just about anywhere via your iOS device. The iPhone app is an update of last year’s offering, with a few features aimed at both home viewers and people attending the golf tournament. The iPad-optimized Official Masters Tournament offering is a new release—separate from last year's iPad app—with the most notable difference being its price tag: This year’s iPad app is a free download. Whether you use the iPhone or iPad version of The Masters app, the primary allure is live streaming video. Had you already installed either app on your iOS device Wednesday, you could have watched the tournament’s Par 3 contest. (You would have seen a lot rain, however.) During the four days of The Masters, the app displays tournament play from Amen Corner, the nickname bestowed upon Augusta National’s especially tricky Hole Nos. 11, 12, and 13. The app also streams video from the 15th and 16th holes, and includes two Featured Group channels that follow selected players on the back nine holes of the course. (Last year, The Masters app included only a single Featured Group channel.) When the tournament’s on CBS and ESPN, the apps will offer a live highlight channel, plus an assortment of other on-demand video highlights as well. Video streams over both Wi-Fi and cellular connections, though live video can eat up a healthy chunk of your allotted data if you’re connecting via 3G. The video functionality works only for U.S. users. Get an aerial view of Augusta National with flyover videos of all 18 holes. The iPhone’s Masters app includes pairings, tee times, player information, and other news. A live Leader Board will provide updated scoring once the tournament gets underway. And you can get an overview of each of Augusta National’s 18 holes with flyover videos and par and yardage data. The iPhone app has some additional features for people who find themselves in Georgia for the tournament this weekend. It includes driving directions and an interactive map to help spectators—sorry, patrons—make their way around the course. The iPad version incorporates many of the features on the iPhone app—the live scoring, course overview, pairing information, and news coverage. It also presents a photo gallery featuring images from this year’s tournament as well as historic photos, and a timeline showcasing the history of The Masters. The timeline is a particularly well-thought-out use of the iPad’s interface: It’s scrollable, and you can tap objects like an early map of the Augusta National course or photos from past tournaments for a closer look. 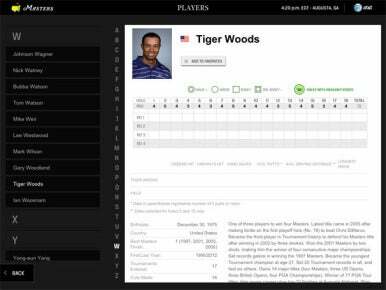 The Masters app features a scorecard for each golfer that will be updated in real-time with access to video highlights from the tournament. In fact, digging around The Masters app, you’ll find a lot of little details and nice touches. The course information section of the iPad app, for example, features not only the aerial flyover—accompanied by piano music—but a panel of information about the hole (including the story of its nickname) and a gallery of still photos. Player scorecards pack in a biographical sketch of the golfers, including their records at past Masters tournaments. 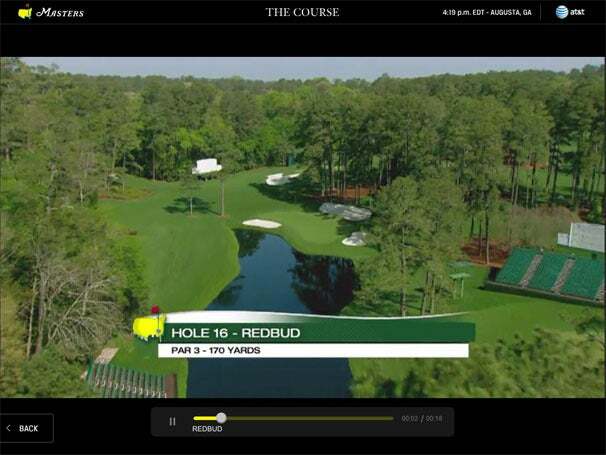 And a video camera icon suggests that the interactive scorecard will feature tappable video highlights once this year’s tournament tees off on Thursday. For a golf tournament that only allowed full television coverage starting in the 1990s, The Masters now finds itself on the cutting edge of mobile sports coverage with this year’s iOS apps.